Saturday Club was a pop music programme which started life as Saturday "Skiffle" club in 1957 on the BBC Light Program. The original idea came from producer, Jimmy Grant who wanted to showcase local London skiffle groups that played in the coffee bars of Soho. The 30 minute program aired on a Saturday morning and was presented by Brian Matthew (a former BBC announcer and newsreader). ‘Saturday Skiffle Club’ proved popular although executive concerns were expressed early on at the amount of North American work songs featured. A concerted effort was made by Aunty to encourage more traditional UK material. This resulted in skiffle cover versions of traditional songs like, The Skye Boat and My Bonnie. However because the meter of the new footbeat genre suited American music better the number of songs which could be comfortably converted was small. This however did not deter the BBC management who were determined to feature UK traditional songs. As a result the program featured folk music, trad jazz and skiffle. Official eyebrows were raised when acts preformed spirituals despite the traditional songs being part of a major revival of US folk music. Grant and his staff dug their heels in and argued the need for these songs and their relevance to skiffle music. The program was run on a shoestring budget and because of ‘needle time’ needed to feature acts which would not expect to be paid much money. Headliners like Lonnie Donegan did feature but because he demanded larger fees his appearances were sporadic. In 1958 under severe financial constraints the show featured more solo instrumentalist such as Johnny Parker or Dill Jones, because they were cheaper to hire. Other regulars to the program included: The Vipers, Chas McDevitt with Shirley Douglas, Johnny Duncan and his Bluegrass Boys, George Melly and his Bubbling Over Four, Russell Quaye’s City Ramblers, Dickie Bishop and his Sidekicks, the Bob Cort Skiffle Group, and the Nancy Whiskey Skiffle Group. Brian was a great fan of Trad Dad Jazz and featured many of the bands of the time including Kenny Ball and the jazz Men and Acker Bilk. Brian was recorded singing with his musician mates on a parody of Trad Dad Jazz in 1961. As the new decade began, more rock’n’roll and beat music featured with acts like Johnny Kidd, Jim Dale, Adam Faith and Tommy Steele. Money again was tight and mainline acts such as Cliff and the Shadows and Marty Wilde were considered too expensive although they did eventually make an appearance. The cheapest way to bring International stars to the program was when Brian Matthews recorded interviews with stars like Pat Boone and Gene Vincent. The Musician Union had set an embargo on overseas acts which prevented them from performing, but after the embargo was eventually lifted, Eddie Cochran and Gene Vincent appeared on ‘Saturday Club’ in 1960. Along with Duane Eddy and Bobby Darin, Cochran and Vincent became the first American performers to play on ‘Saturday Club.’ Many other Americans followed including: the Everly Brothers, Jerry Lee Lewis, Bo Diddley, Chris Montez and Tommy Roe. 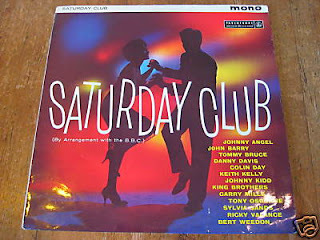 In 1960, an LP, Saturday Club, was issued, on the Parlophone label, featuring 13 performers including Tommy Bruce, Ricky Valance, Johnny Kidd, Bert Weedon and The King Brothers. On the fifth anniversary of the program in 1963 the lineup included: the Beatles, the Everly Brothers, Tommy Roe, Frank Ifield, Kathy Kirby, Clinton Ford, Joe Brown and his Bruvvers, Kenny Ball’s Jazzmen and Arthur Greenslade’s group with strings. 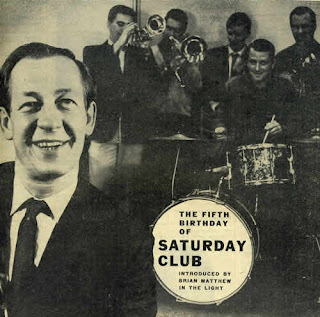 Ray Orchard replaced Brian Matthew as anchor man in 1965 but the introduction of Radio 1 in 1967 effectively killed off ‘Saturday Club’. The BBC did keep it going for a year with Keith Skues and it was broadcast on Radio 2 with the first featured act the Bee Gees. Other luminaries to appear included: Dusty Springfield, Wayne Fontana, the Searchers, Jimi Hendrix, Small Faces, Cream and the Who. The BBC finally axed Saturday Club on 18 January 1969. The success of Saturday Club was based upon a very simple but effective format. In its time it brought many lesser known performers to wide attention and despite operating on a very limited budget was incredibly influential on popular music trends. The recordings of Saturday Club are available and encapsulate both the pre-Beatle and early Beatles period and for collectors of UK music these are a must have acquisition. Brian Matthew began presenting Sounds of the 60s in 1990, and would often use the same vocabulary and the same measured delivery as he had used in previous decades. Brian Matthews died in 2017 and the program was presented by Tony Blackburn.